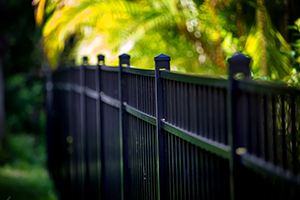 Compared to other fence materials, such as wrought iron, aluminum is clearly the best choice. Its natural resistance to corrosion allows it to weather the elements year after year without rusting, chipping, peeling, or otherwise deteriorating. Additionally, your aluminum fence will require minimal upkeep, as it will never need to be painted and can be easily cleaned. Not only is aluminum fencing suited to a wide range of applications, but it can also be installed seamlessly on any property. If, for instance, your yard is sloped or uneven, an aluminum fence is a great choice, as it will prevent unsightly gaps and awkward transitions. The aluminum fencing that Virtue Fence offers has a sleek, modern appearance that will enhance the curb appeal of any home. It is also available in a wide variety of styles and with decorative elements, such as finials, to suit your unique tastes. What’s more, we offer aluminum fencing with colorful, premium finishes that are highly resistant to scratches and other blemishes. In addition to top-of-the-line fencing options, Virtue Fence is committed to providing personalized service and superior craftsmanship. We’ll work with you to ensure you get an aluminum fence that is ideally suited to your needs, aesthetic preferences, and budget. We also hold our team of trained and experienced installers to the highest quality standards and back their work with a three-year warranty. To learn more about how we can enhance your property in Northern New Jersey, contact us today.